Rated PG-13 for sci-fi action violence, some language and brief suggestive comments. I am a little out of touch with the inside-baseball commentary on superhero movie and sci-fi franchises, so I have to ask the reader to indulge me a bit. I’m perhaps not the best person to draw the distinction between something called “fan servicing,” which I understand is very, very bad, and giving an audience what it wants, which I have been told from an early age is at least kind of good. That said, I can report from where I sat at a preview screening that was evenly divided between what I suspect were sympathetic-from-the-get-go reviewers and enthusiastic fans and their families, “Spider-Man: Homecoming” is a comprehensively crowd-pleasing success. This is the second movie to star Tom Holland as Spider-Man in this incarnation (after “Captain America: Civil War”). Both the superhero and his high-school-student alter-ego (or is it the other way around? That’s another thing I can be hazy on) Peter Parker, are presented at their most awkwardly adolescent. In the timeline of the MCU (Marvel Cinematic Universe), “Spider-Man: Homecoming” begins directly after Spider-Man’s participation in a superhero gang fight in 2016’s “Civil War.” But the movie itself begins eight years prior to that, in the aftermath of Loki unleashing the Chitauri, which trashed much of NYC and the Avengers’ sleek headquarters in 2012’s “The Avengers.” (That’s a 2012 movie, and it’s only 2017 now, but don’t look at me, I’m just going by the on-screen texts.) In the wreck of the Avengers’ HQ, Michael Keaton’s hard-working salvage dude Adrian Toomes is showing a colleague a drawing of the Avengers scrawled by Toomes’ own ten-year-old child. Those in the audience with a familiarity with possibly fake Chekhov quotes will recognize this as the gun on the mantelpiece in Act One that is obliged to go off in Act Three, and by Odin, off it does indeed go, but it’s a long way from Act One to Act Three. Soon Toomes and his crew are kicked off the site by an officious Tyne Daly and it’s revealed that Tony Stark is ostensibly self-dealing by heading a government clean-up crew to handle the superhero mess. To give credit to the six screenwriters on this movie, the oodles of rather convoluted plot detail are relatively clear even if you’re not super-paying-attention. “Spider-Man: Homecoming” sees Peter Parker being shunted aside by his adult mentors Tony Stark (Robert Downey Jr.) and Happy Hogan (Jon Favreau) to tackle the more down-to-earth challenges of high school on his own. 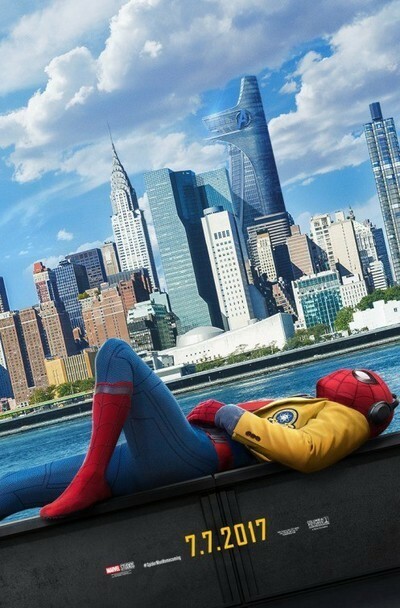 These include Parker’s pushy best friend Ned (Jacob Batalon), who wants to know all about Peter’s “internship” at Stark Enterprises; the High School Academic Decathlon (College Bowl for high schoolers, that is), whose captain Liz (Laura Harrier) Peter has a major crush on; and Peter’s guardian Aunt May (Marisa Tomei) from whom Peter must hide his amateur crime-fighting activities as Spider Man, and protect from the possibly wayward affections of a local sandwich shop manager. This version of Peter Parker is less cocky than the prior incarnations of recent years. He is also rather whiny a lot of he time. The Peter Parker I grew up with was agonizingly tetchy, but he didn’t hunch over like a weasel whenever he had to get out of a social situation to go fight crime. While Holland hunches over with sincerity and skill, I have to admit I am not enthralled by this variation on the teen superhero’s alter-ego (I don’t think I got it right this time either). Peter Parker as nerd, I can roll with; Peter Parker as dork, not so much. That said, once the movie gets all its ducks in a row (and after serving up a Queens-set crime fighting foray that highlights some of the movie’s worst visual effects, looking flat-out like video game action for most of its length), it delivers some genuinely effective action/suspense set pieces, including one set in the Washington Monument that worked me up a treat. A subsequent near-disaster on the Staten Island Ferry is less effective, but does lead to the movie’s most effective narrative coup. That is, the nifty Spidey suit that Stark afforded Parker is taken away, and “Spider-Man: Homecoming” has to swing to its thrilling climax with its hero in a very low-rent outfit. Is this the opposite of “fan-serving,” or is it “fan-serving” itself, presented in a cleverly inverted form? I cannot say. I can say that the film’s adaptation of one of the original “Spider Man” comic’s most graphically exceptional scenes, from 1966’s Issue 33, “The Final Chapter!” um, isn’t as good as the comic book was, quite honestly. But I give director Jon Watts and the other seventy thousand craftspersons involved in this production credit for trying. I can’t emphasize enough that these are my personal impressions, and I understand they are probably going to be out of step with those of the masses of people who are going to attend this movie and have a good time with it. This is a picture designed to provide bright vivid thrills and breezy bits of amusement. As someone who’s kind of trained to notice such things, I might say “This movie really wastes the talents of Hannibal Buress and Martin Starr”; whereas a less concerned person will see these performers and say, “Oh yeah, those guys are funny.” Marvel movies are not concerned with altering your precious bodily fluids. This one is a slightly better than average example of the species. Watch it in good health.